In just a few decades, Miami has been transformed from a sleepy Southern city into an energetic Hispanic metropolis. How? Ask Americans about Hispanic migration to the United States. For many of them, the first image that will come to mind will be one of impoverished migrants walking across the Arizona desert to enter the country illegally. But alongside the millions of undocumented men and women who have arrived with little money or formal education in recent decades from Mexico and other Latin American countries, the US has also received a smaller but significant inflow of more affluent migrants from south of the border, many of them choosing to live in Miami. Armed with work permits, university degrees, and high expectations of upward mobility, many of them buy houses with swimming pools, big lawns and access to good school districts. Elsewhere in America, politicians like Donald Trump promise to build big walls along the border with Mexico. But Miami seems more at ease with the overwhelming influence of Latin America in this metropolis of 2.5 million inhabitants, where close to 70% of the population is Hispanic, Spanish is spoken almost everywhere and most of its current residents seem to be fine with it. Juan Pablo Restrepo is originally from Colombia. He lives with his wife and son in the upscale neighbourhood of Key Biscayne, near the beach. He works as a music curator for Mood Media, a company that provides music played inside retail stores across the country. 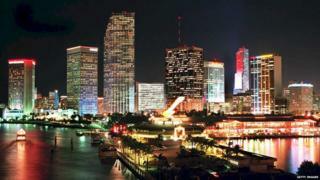 "Miami is very attractive for Latin Americans. They get to be in the United States, with all its advantages, but keeping familiar cultural roots," says Mr Restrepo. "It is also a very efficient bridge between both cultures, Anglo and Hispanic. If you go to other places in the country, you feel the cultural and racial tensions to a much larger degree," he adds. Mr Restrepo is part of a Latin diaspora that has turned Miami into the US metropolis with the largest percentage of foreign-born residents, close to 51% of the population, according to Guillermo Grenier, a professor of sociology at Florida International University. BBC News World On The Move is a day of coverage dedicated to migration, and the changing effect it is having on our world. A range of speakers, including the UNHCR's special envoy Angelina Jolie Pitt, and former British secret intelligence chief Sir Richard Dearlove, will set out the most important new ideas shaping our thinking on economic development, security and humanitarian assistance. You can follow the discussion and reaction to it, with live online coverage on the BBC News website. "Cubans began coming here (after the Revolution) in 1959 and after that, you had layer upon layer of Latinos coming in from different countries," says Mr Grenier. In the past few years they have been followed by around 100,000 middle-income Latin Americans from countries including Colombia, Argentina, Venezuela and Brazil among others, he tells the BBC. "If you are a business owner in Latin America you can come to Miami, you have an audience, a market, you can make five calls, in Spanish, and set up the infrastructure for your business," he adds, remarking that close to 25% of businesses in the state of Florida are owned by Latin-American immigrants. Mr Grenier sees Hispanics in Miami occupying a different position in the power structure compared to elsewhere in America. "In Los Angeles, when you hear Spanish, it is often the language that the waiters or the cutters doing your lawn speak in the background. In Miami, the people who own the restaurants and the lawn are the ones who speak Spanish." Opponents of immigration claim it places an economic burden on the host society. But here, many see business opportunities in catering to the newcomers. Mercedes Guinot, a real estate agent, sells many houses to well-to-do Latin American immigrants. She estimates that 80% of her clients are from Latin America, paying an average of about $450,000 (£311,000) for three or four-bedroom houses with a large yard and a swimming pool. "They tend to pay in cash", she says approvingly, before taking off to see a prospective client in Weston, a Miami suburb of manicured lawns and lush landscaping that is home to so many Venezuelans it is often referred to here as "Westonzuela". So, has Miami avoided completely the controversy around immigration raging elsewhere? It certainly did not in the not-so-distant past. Local residents remember the tensions that followed a 1980 referendum declaring English as the official language of the city, a measure that stayed in place until the early 1990s in the vain hope of containing the growing influence of Spanish. And over the years, vast numbers of Anglo residents uncomfortable with the demographic tsunami that changed their city from a sleepy Southern resort into a largely Latino metropolis have voted with their feet, leaving town once the balance of power in Miami tipped decisively in the direction of the Hispanic community. Only around 15% of Miami Dade county's current residents are white non-Hispanics, says Guillermo Grenier from Florida International University. And nobody should think that life is all that easy for Latin Americans migrating to Miami, even for those from comparatively well-to-do backgrounds, warns Kathy Riano-Lopez, an immigration lawyer originally from Colombia. "The first immigration case I won was my own," says Mrs Riano, who arrived in the United States in 2004 claiming asylum from political persecution back home. Despite graduating from prestigious universities in Colombia and Spain, she remembers it took years for her to get her degree recognised here. Around 70% of her current clients are from Venezuela, fleeing the country's chaos. "Many are willing to come to this country to do jobs they would never consider at home," she said. Still, the allure of this city, in many ways an embodiment of affluent Latin-American aspirations of a life of safety, stability and comfort, seems likely to continue for the foreseeable future. And Miami itself appears ready to continue to embrace the cultural diversity they bring with them, along with the economic prosperity they have helped to create in their new hometown.